At Dallas Vein Specialists all patients are treated in the office including those undergoing the laser vein treatments (endovenous laser ablation) and vein removal (microphlebectomy). 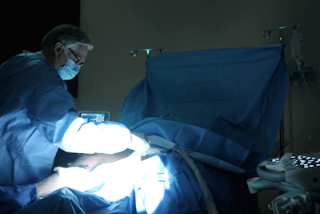 (Good descriptions of these procedures may be viewed at our website DallasVeinSpecialists.com. Patients, young and old, even those with chronic disease such as heart problems, have been successfully treated in our in-office operating rooms. Patients taking anticoagulants, such as Coumadin or Plavix, are easily managed and may undergo the minimally invasive procedures without increased risk.